CALVIN TRILLIN HAS POSTPONED TONIGHT’S WRITERS BLOC PROGRAM DUE TO ILLNESS. HE WILL RESCHEDULE IN THE NEAR FUTURE. WE APOLOGIZE FOR ANY INCONVENIENCE, AND WE HOPE THAT YOU’LL JOIN US IN WISHING MR. TRILLIN AN IMMEDIATE RECOVERY. To make a reservation, please e-mail your request to reservations@writersblocpresents.com. Tickets are $20 each. 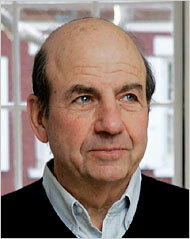 Writers Bloc is delighted to present Calvin Trillin with Kevin Nealon. We love Calvin Trillin for his very serious musings on food; for his rhyming poetry about presidential (and decidedly non-presidential) candidates and the news of the moment; for his fiction; for his beautiful and moving nonfiction books that bring broad and profound understanding to the reader about topics intimate and personal; and for his hilarious essays in The New Yorker, Time and The Nation. Calvin Trillin writes about almost anything that’s interesting. From racial desegregation to summers in Provence, from Texas barbeque to remembering a college friend who died, we know that each Trillin article that shows up in The New Yorker or in Time will be something to savor. Trillin’s food writing reveals more about a North American time and place than it does about the food in question. (He has dedicated a lot of ink to the Montreal mess called poutine, so therefore we include Canada in his culinary conquests.) From Canada to the deep South, Trillin trolls restaurants and truck stops, searching for and trying all cholesterol-sodden treats that define a particular locale. Whether poutine in Quebec, chicken in New Orleans, or street food in Mexico, Trillin’s writing on food can hardly be classified. Yes, there’s humor, social observation, and cultural history– and it has often been a love story to his family. His novel, Tepper Isn’t Going Out, is an absolutely hilarious declaration about one Manhattan man’s determination not to lose his precious parking space, no matter what. In his new book, Quite Enough of Calvin Trillin: Forty Years of Funny Stuff, Trillin dishes out some pieces that we might have missed over the years—his political poetry (“On A Clear Day, I See Vladivostok”); a riff on John Edwards’ hairdo; The Shoe Bomber, and so much more. We adore him because while he is one of the great political and social satirists of our time, his humor is utterly good-natured. Another brilliant political and social satirist is Kevin Nealon. He is, after all, one of our all-time favorite anchors of Saturday Night Live’s Weekend Update. And now in Weeds, he’s one of our favorite sketchy characters on television. Besides his stand-up and one-man comedy shows, Nealon is an author as well. In his recent book, Yes, You’re Pregnant But What About Me? Kevin chronicles his wife’s pregnancy and personal revelations about having a kid in the middle of middle age. Nealon explores his own childhood and life experience while relating it to the specter of oncoming parenthood. Hilarious asides, with digressions that really should be topics of many more books of his in the future. No surprise here: it’s very very funny. At the Writers Guild Theater, 135 South Doheny Drive, Beverly Hills. To make a reservation, please e-mail your request to reservations@writersblocpresents.com. Tickets are $20 each (cash or check only at will call). Your reservations are confirmed via email. If you are unable to attend for any reason, please notify us. Thank you. We gratefully acknowledge the Culinary Historians of Southern California for their interest in this program. Check out their organization and visit their website at chscsite.org. This entry was posted in Author, Misc.. Bookmark the permalink.